Tre mesi dopo aver restituito il cuore di Emery Thane, maestro di arti magiche, al suo legittimo proprietario, Ceony Twill è sulla buona strada per diventare una Piegatrice. Adora dare vita alle forme che disegna e creare esseri inanimati da semplici pezzi di carta. Durante il suo lungo apprendistato, Ceony Twill ha tenuto nascosto un segreto al suo stesso mentore, Emery Thane: ha scoperto di poter praticare forme di magia diverse dalla propria, un'abilità da sempre ritenuta impossibile da acquisire. Ormai è giunta al termine del suo percorso e sta per affrontare l'esame finale, ma proprio quando tutto sembra andare per il verso giusto ecco che gli imprevisti si mettono sulla sua strada, complicandole un bel po' la vita. But when one magician with a penchant for deadly scheming believes that Ceony possesses a secret, he vows to discover it… even if it tears apart the very fabric of their magical world. After a series of attacks target Ceony, and catch those she holds most dear in the crossfire, she knows she must find the true limits of her powers… and keep her knowledge from falling into wicked hands. 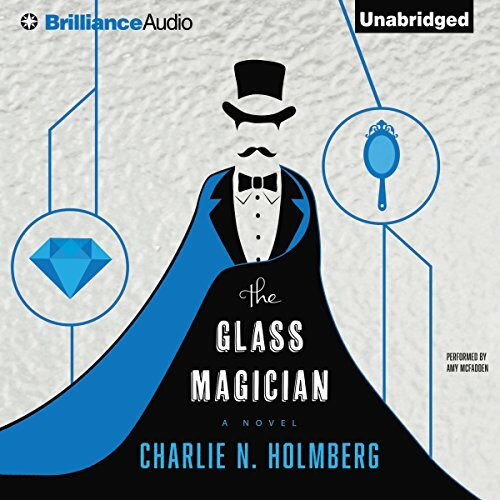 The delightful sequel to Charlie N. Holmberg’s The Paper Magician, The Glass Magician will charm listeners young and old alike. loved this series. a must read. great story line and magical world you can delve into. Nice mix of magic and love story. Nice mix of magic and love story. Great character development. Interesting descriptions to set the stage. What made the experience of listening to The Glass Magician the most enjoyable? I enjoyed the lighthearted tale and characters in the Paper Magician so I went on to read the Glass Magician. It was just as entertaining as the first book and I found the narration to be a bit less hurried which made for more enjoyable listening. Nice escape from all the tragic headlines and news of the day. Reading this book is a nice respite from reality! Reading the first is necessary I think, to understand the characters and their motivation, but this second book I feel is better. The story jumps right onto the action, and keeps a rapid pace until the end. The narrator does an amazing job creating the characters. Helping me grow found of the main females's annoying traits. I really enjoyed this novel and am eager to start the next. On more than one occasion while listening I thought about how this story could be made into a movie. Don't even waste 2$ on the audio version. 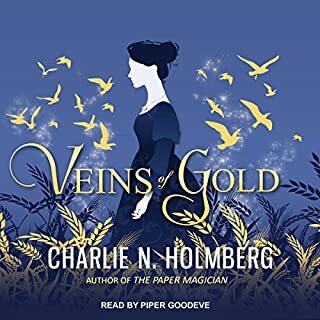 Would you try another book from Charlie N. Holmberg and/or Amy McFadden? I love these books but the audio version was terrible! I turned it off and went back to reading . Narrator was too fast and grating voice, accents were laughable, and her character narrations seem to change personality. The butler! I can just see him cleaning. What three words best describe Amy McFadden’s voice? Could you see The Glass Magician being made into a movie or a TV series? Who should the stars be? yes hmmmm good question on the stars. Stopped the audible version before it ruined the book for me - and I love the book series. I wish the writer had slowed down the ending, it would have been better as a longer novel. And it was jarring to be in the viewpoint of someone not ciannny seeing as the entire first and majority of this novel are from her point of view. Wonderful continuation of the series, got me excited for the 3rd book. The narrator, in my opinion, seems to capture the thoughts and feelings of the main character extremely well as she goes throughout her journey. My only beef is that, unlike the first book, where the primary character doesn't follow a typical path, in this book the author forces the protagonist into a really stupid path of action. The rest of the book? Good. Good character, progression, more about how things work in the universe, good twist. Just the one thing. Worth the read if you liked the first one for sure. The melodramatic narration is truly annoying, and the terrible, fake British accent doesn't help. The story is fun, though the author makes some strange choices near the end that seem not only out of character for the two protagonists but also illogical. Still, it's a worthy sequel. Read the series in order. Book one is the Paper Magician and is great. This book keeps up the pace and thrills you with the action and characterisation. I sulked when I had to put it aside for work. Good story. Well narrated. Yet it could've had more plot. Still, I'm looking forward to listening to the third book. Enjoying the series. I was disbelieving that the accents could be worse than last time, but it really was. This one is better than the first one, and at least I knew what to expect in terms of the gruesome bloody scenes. The story was fast-paced and interesting. However, the narrator's bad British accent was even worse this time. What's weird is that I heard her narrate in a normal American accent and it was fine - she should maybe stick to what she's good at. A great and, for me, highly anticipated sequel. I love this series of books and the narration really brings the characters to life. Read or listen and you won't be disappointed. 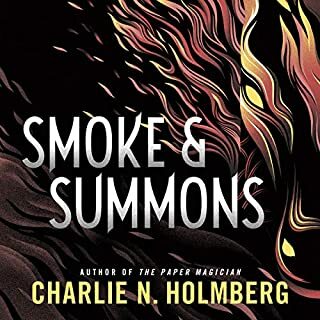 Would you ever listen to anything by Charlie N. Holmberg again? Not if I can help it. The storyline is nonexistent. Better research is needed, don't write about a place you've never been to without researching first! Author seems to think a lavatory contains a bath... that would be a BATHroom! This is just one of many many mistakes. Would you be willing to try another one of Amy McFadden’s performances? By a different author maybe. I'm willing to give her another chance and put it down to poor writing. None spring to mind. There was zero plot, poor research and all the characters are one dimensional.